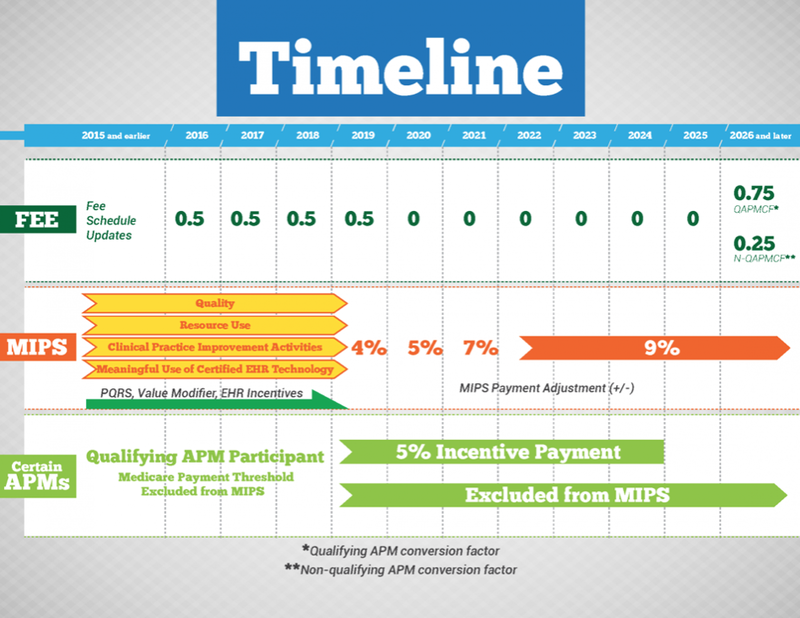 The Advanced Alternative Payment Model (AAPM) system. 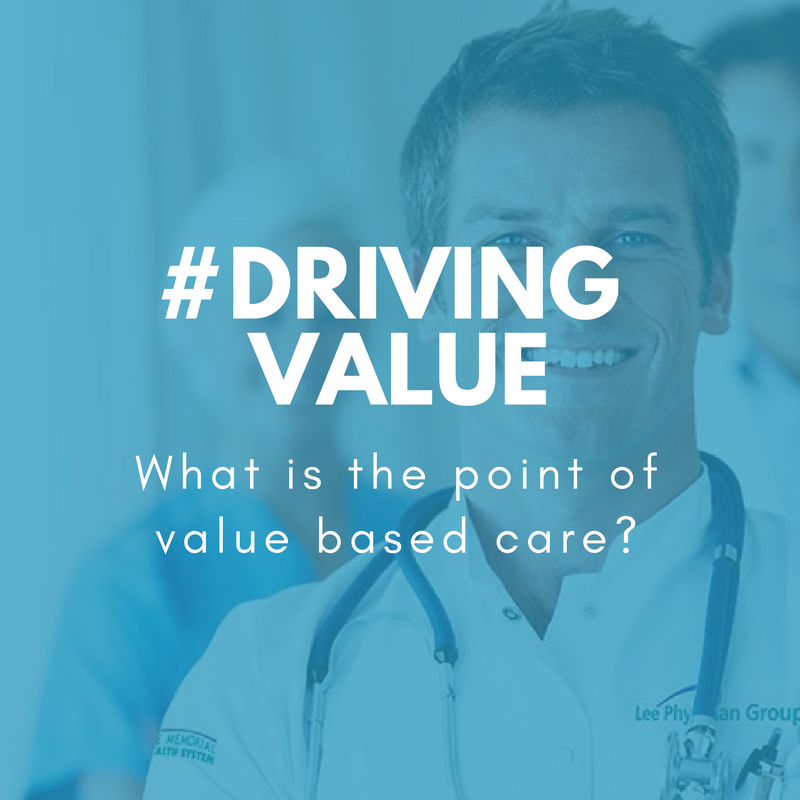 Both frameworks are regulatory “environments” that establish performance measurements used to score clinicians to determine payment adjustments and bonuses. The Merit-based Incentive Payment System (MIPS) is the “default” framework under the QPP. 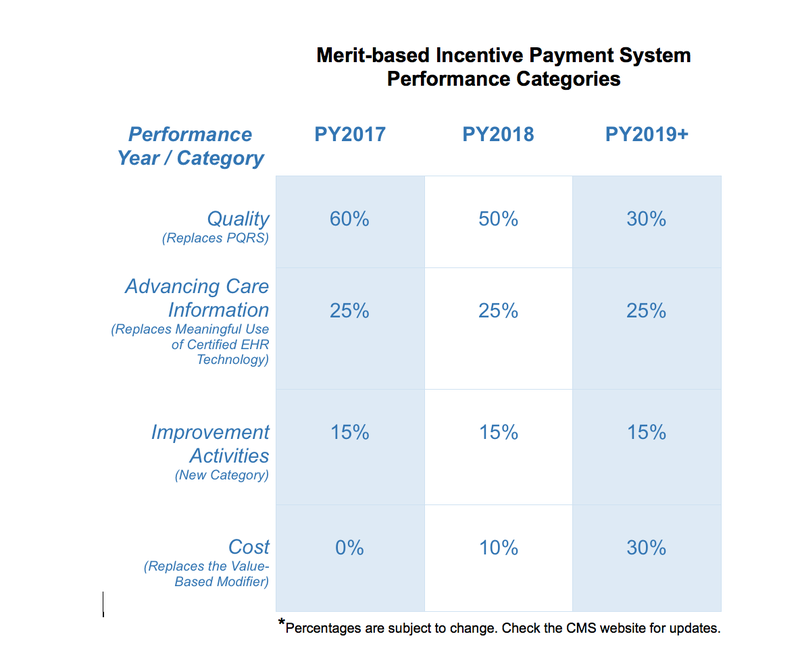 Under MIPS, the three existing reporting programs—the Physician Quality Reporting System (PQRS), the Value-based Payment Modifier (VBPM), and Meaningful Use of Certified EHR Technology (MU)—are renamed and combined with a new Improvement Activities (IA) category to score physician performance. Who must report under MIPS? The Health and Human Resources (HHR) Secretary may broaden this list of eligible clinicians to include other providers in 2019+, including physical and occupational therapists, speech-language pathologists, audiologists, nurse midwives, clinical social workers, clinical psychologists, and dietitians/nutritional professionals. ‍Clinicians in their first year of Medicare Part B participation. Clinicians billing $90,000 or less in Medicare Part B charges, or who provide care for 200 Part B patients or less in one year (this was raised from $30,000 and 100 patients in performance 2017). Clinicians who are participating in Advanced APMs. Eligible clinicians are incorporated into the MIPS framework by default. They can choose to report as an individual, although most clinicians will choose to participate within a group, or “virtual” group. Virtual groups are multiple small practices of 10 or fewer eligible clinicians who report as one entity, regardless of specialties or locations. In addition to the exemptions for eligible clinicians, there are special exemptions outlined for clinicians working in unique circumstances, such as clinicians practicing in Rural Health Clinics (RHCs), in Federally Qualified Health Centers (FQHCs), and in Critical Access Hospitals (CAHs). The Centers for Medicare and Medicaid Services (CMS) has also designed special rules for clinicians who are non-patient facing eligible clinicians and MIPS APM participants. There are also special rules outlined in the new Improvement Activities (IA) category under MIPS for eligible clinicians in small practices (15 or fewer clinicians and solo practitioners); clinicians in designated rural areas; and clinicians working in designated Health Professional Shortage Areas (HPSA). How are clinicians scored under MIPS? ‍Quality—the Quality category of MIPS replaces the PQRS and requires eligible clinicians to report data for six quality measures related to efficiency, process and structure, patient outcomes, and patient experience. Reporting options are given to accommodate for differences in specialty and practices. Advancing Care Information—the ACI category of MIPS replaces MU and scores clinicians on how well they use EHR technology, with a special focus on objectives related to interoperability and information exchange. Improvement Activities—the IA category of MIPS is a new category that encourages eligible clinicians to participate in activities that improve clinical performance in areas such as care coordination, patient engagement, and patient safety. Credit is also given for clinicians who participate in Alternative Payment Models (APMs) and in Patient-Centered Medical Homes. Cost—the Cost category of MIPS replaces the VBM and evaluates eligible clinicians on measures related to resource utilization, calculated using Medicare claims. No clinician reporting is necessary. Each performance category has measurements and/or activities that must be reported to earn points toward a clinician or group’s final score. Performance data is reported by the clinician or group, and scores are combined to establish a final score (1-100). CMS has given clinicians the flexibility to choose and to report on specific Quality and Advancing Care measurements that fit their practices. CMS also allows for clinicians to simply attest to completing Improvement Activities for reporting purposes. When combined with Cost data calculated from adjudicated claims, clinicians’ final scores are compared against CMS-defined performance thresholds, and the composite performance score (CPS), or MIPS Score, is used to determine the clinicians’ percentage of Medicare reimbursement payments. 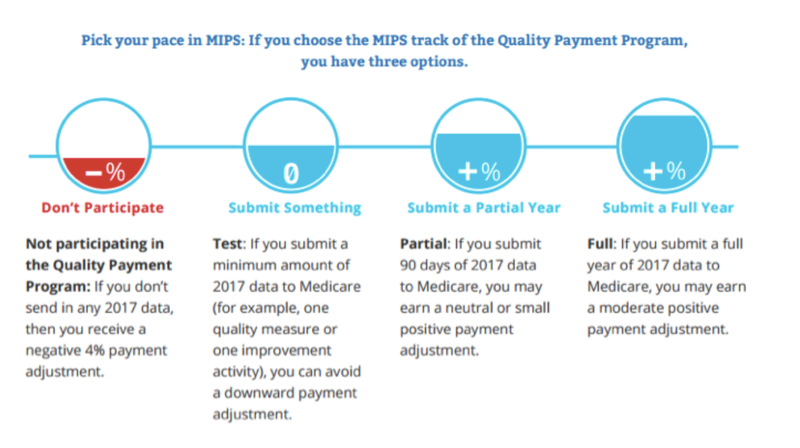 MIPS is designed to be a budget-neutral program, but there are $500 million allocated to provide additional incentives to exceptional performers. Here are the payment adjustments for calendar years 2019 and 2020, based on performance years 2017 and 2018. ‍> 70 points	Positive adjustment; eligible for the exceptional performance bonus of at least an additional 0.5%. 4 – 69 points	Positive adjustment, not eligible for exceptional performance bonus. 0 points	-4% Negative adjustment. 15.01 - 69.99 points	Positive adjustment, not eligible for exceptional performance bonus. 0 – 3.75 points	-5% Negative adjustment. The MIPS score will either exceed, meet, or fall short of the performance thresholds set by CMS, and this score determines a positive, neutral, or negative Medicare Part B payment adjustment. Payment adjustments begin in 2019 (performance year 2017), and gradually increase from 4% to 9% in 2022. Each year’s adjustment is based on performance periods from two years prior, and CMS awards performance bonuses to clinicians with “exceptional performance.” Here’s the CMS Timeline for the Quality Payment Program as a whole (pictured). With the Pick Your Pace option, CMS recognizes the need for some clinicians to gradually transition into the new payment reform system. In spite of the complexity and ongoing evolution of the Quality Payment Program, the Centers for Medicare and Medicaid Services (CMS) is committed to making sure of the following: the Program’s measures and activities are meaningful; clinician burden is minimized; care coordination is better; and clinicians have a clear way to participate in Advanced APMs. CMS has dedicated a website to providing resources to help clinicians understand the workings of the Quality Payment Program (QPP). This resource library features detailed information and ongoing updates regarding the Merit-based Incentive Payment System (MIPS) and the Advanced Alternative Payment Model (AAPM), including details involving category scoring, measures and guidelines; performance thresholds; payment adjustments; program timelines; and other important information alluded to in this article. You can find it here https://qpp.cms.gov/.